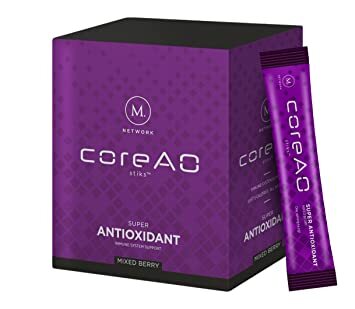 CORE AO is a safe natural supplement that contains powerful anti-inflammatories and antioxidant. This supplement combines Mangosteen, Grapeseed Extract, Green Tea Extract, Acai, Bilberry, Cranberry, L-arginine, vitamin C and vitamin D3. It comes in a convenient delicious drink mix that tastes incredible. This supplement may help decrease the bodies systemic inflammation, skin inflammation, improve heart health, improve digestion and boost brain function to mention a few of the health benefits and there are many. This superfruit mix may aid in protecting and supporting joint tissues and ease pain that often comes with arthritis, age, weight gain and/or athletic workouts. This works for both men and women, those that have active lifestyles such as athletes all the way to seniors. CORE AO is all natural and NON-GMO product with no artificial ingredients, no artificial preservatives or colors. It has zero calories, no sugar and is gluten-free. This product is made in the USA. This drink is easy to mix by simply adding water. You can drink it as a hot tea or cold beverage. It’s safe to drink throughout the day. The ingredients are listed below separately with a description of what each one does in the body. Inflammation is the body’s normal response to infection and injury. It is necessary to heal wounds inside and on the surface of your body. However, if left unchecked can play a major role in some chronic diseases. The immune system generates inflammation to repair and heal damaged tissues. The immune system also protects you from foreign invaders such as bacteria and viruses. Long term inflammation (chronic inflammation) has been linked to stroke, heart disease and autoimmune disorders such as systemic lupus erythematosus (SLE) and RA (rheumatoid arthritis). However, a healthy lifestyle and diet can keep inflammation at bay. There are two forms of inflammation known as acute (short-term) and chronic (long-term). Acute inflammation happens when, say for example, you have a sprained ankle, cut on your knee or a sore throat. This is a short-term reaction and localized to the damaged area. Symptoms of acute inflammation include swelling, heat, redness, loss of function, and pain. This occurs because white blood cells (immune cells) migrate to area of damage and release chemicals that cause blood vessels to become leaky. This allows white blood cells and molecules to get into the damaged tissue so repair can begin. The increase of blood to the area is what is responsible for redness, swelling, and heat. The pain comes from damaged nerve endings. Other molecules are released to create blood clots to stop the bleeding. A scab forms over the wound and gradually goes away. So, the inflammation is short-lived. Chronic inflammation is different in that it can last a long time and can affect the whole body. This is a systemic inflammation that can develop into disease. Initially, this is a low-level form of inflammation that is triggered by a perceived threat by the immune system as there is no disease or injury at that time. White blood cells begin looking for injury but in reality, have nowhere to go and nothing to do so they attack healthy organs, tissues, and cells. There is a marker for chronic, low-grade inflammation in blood so you can be tested for it (C-reactive protein). In the case of RA, the cause of inflammation is different. It is believed that an RA individual became infected with a virus or bacteria early in life and made antibodies to certain proteins on the surface of these invaders. As time passes, the genome (DNA) accumulates mutations to certain proteins. These mutations can make your normal protein look like a virus/bacteria protein so the immune systems sees that as foreign and attacks it. In this case, it’s a protein in your joints. The immune system generates antibodies to that mutated protein. The antibody binds to the protein and marks it for destruction. This generates inflammation and it will get worse over time. You can get inflammation under control with healthy lifestyle and diet rich in anti-inflammatories and antioxidants. A number of antioxidants are produced by the body and you can get more of these through the foods you eat. Supplementation is another way. Antioxidants are an important part of your body’s powerful defense system. To understand these molecules, you need to know about the oxidation process. All your cells use oxygen in chemical reactions where electrons are constantly being shifted around. In order for our cells to generate energy to run metabolic pathways, electrons are removed from amino acids, fatty acids and sugars and added to other molecules. This creates unstable and highly reactive molecules known as free radicals. The free radicals quickly combine with other elements. This is like a chain reaction that can keep going for some time. Free radicals can break molecules and/or rearrange them as well so they no longer work. Free radical production occurs under normal cellular processes but they are also produced when you are exposed to smoke, physical exercise, air pollution, alcohol and ultraviolet light, for example. Antioxidants come to the rescue and keep oxidation under control. They donate electrons to free radicals to neutralize them. However, over time, cells can be overrun with free radicals and can’t keep up. This leaves a lot of damaged molecules around. Far too many to get rid of so they build up inside your cells and block normal metabolic processes. Energy is lost and you become fatigued. Oxidative stress plays a major role in chronic illnesses, inflammation and aging. This contributes to cancer, heart disease, Parkinson’s, Alzheimer’s and cataracts to mention a few. So, if you have inflammation, you need to take anti-inflammatories and antioxidants. Free radicals generate inflammation. They go hand in hand. One way is to take in superfruits which are loaded with anti-inflammatories and powerful antioxidants. Mangosteen is rich in powerful antioxidants particularly xanthones. These are polyphenols that have anti-inflammatory, anti-bacterial and anti-cancer properties. It also contains cryptoxanthin and carotene which are other powerful antioxidants. It also contains vitamins such as A, C, B1, B2, B3, B6, and B9. It also contains minerals such as potassium, zinc, calcium, magnesium, sodium, and phosphorus. Mangosteen has been used to treat, dysentery, diarrhea, urinary tract infections and thrush. It can aid in regulating weight loss and improve skin health. All these vitamins, minerals and antioxidants help to boost the immune system. It is known as the healing fruit. Mangosteen can also regulate blood sugar levels and has been reported to cure diabetes. Grapeseed extract is rich in a number of antioxidants including anthocyanins, flavonoids, phenolic acids and proanthocyanidin complexes. It is best known for its proanthocyanidins. It protects against oxidative stress, inflammation, tissue damage and can prevent disease. Specifically, it can reduce high blood pressure and improve blood flow, reduce bad cholesterol oxidation reducing the risk of heart diseae, improves bone and collagen strength, reduces pain in the joints, delays the onset of neurodegenerative diseases like Alzheimer’s, protects the kidney from oxidative stress, demonstrates antifungal and antibacterial growth, and protects the liver from toxins such as drugs and alcohol. Green tea contains 30% polyphenols of which the greater percentage is catechin also known as epigallocatechin gallate (EGCG). These are powerful antioxidants that protect you from free radicals and cell damage. Green tea aids in improving brain function and helps to prevent cognitive decline, aids in burning fat for weight loss, lowers the risk of diabetes type 2, and maintains a healthy cardiovascular system. This is another superfruit that is packed with lots of nutrition. These berries contain vitamin A, calcium, chromium, zinc, iron, copper, magnesium, potassium, phosphorus, and manganese. The most notable antioxidant is in the anthocyanin group which protects you from diabetes, heart disease and cancer. Acai berries contain 3 times the number of antioxidants found in blueberries. Animal studies suggest that this berry can lower bad cholesterol levels while raising good cholesterol levels. Moreover, Acai contains plant sterols that prevent cholesterol from being absorbed in the gut. Research indicates that it has anti-cancer properties as well. The powerful antioxidants found in these berries aid in improving memory and learning by reducing oxidative damage. Cranberries contain vitamins C and E as well as flavonoids. Vitamin C is a soluble antioxidant and vitamin E is a fat-soluble antioxidant. The flavonoids carry anti-inflammatory and anti-bacterial properties. Research suggests that this berry lowers bad cholesterol (LDL) and raises good cholesterol (HDLs) levels. Bilberry is best known for its ability to promote eye health. Other health benefits include lowering blood pressure and improving platelet function, protecting DNA from damage, reduces inflammation, and aids in controlling diabetes by stimulating insulin release. Bilberries contain anthocyanins, vitamin C, vitamin E, Ellagic acid (polyphenolic antioxidant) and Resveratrol (super powerful antioxidant). L-arginine is a conditional amino acid meaning you may not be able to make enough in your body depending on your developmental state or health status. This amino acid is important for making proteins and making nitric oxide (NO). NO is a powerful neurotransmitter that aids in blood vessel relaxation which increases circulation. An increase in blood flow to tissues brings in more nutrients, oxygen, and removes toxic wastes better and aids in healing. Vitamin C is also known as ascorbic acid and it is a water-soluble antioxidant found in a number of foods that keeps free radicals at bay. Vitamin C works in water areas of your body, however not in fats like in your plasma membranes of all your cells. You might have wondered why cats and dogs don’t need to take in foods that contain vitamin C but we do. Humans have a gene for the enzyme that makes vitamin C, however over time that gene has accumulated mutations and no longer works. Thus, we need to supplement or take in foods with vitamin C. This helps keep inflammation down. Vitamin D3 also known as cholecalciferol-D3, is a fat-soluble vitamin. It is important for calcium and phosphorus absorption in the gut and is important for those minerals to be deposited in bone. So, it aids in preventing bone disorders such as rickets. Vitamin D is made in the blood stream when sunlight hits your skin. Cholesterol in the blood is converted to vitamin D3 in the presence of sunlight. Quite often inflammation is found around joints when you have arthritis which contributes to bone damage so you need to promote bone health.